Gainesville spray foam insulation is liquid polyurethane that forms into a solid, foam-like substance once it hits a solid surface. The liquid state allows it to penetrate fine cracks and holes in the surface that products like fiberglass can’t protect. Since the entire surface area is sealed, it is much more energy efficient than any other material available. It keeps more warm air in during cold months, and keeps it out when it becomes hot. Your electric bill will reduce, saving you money and helping the environment. 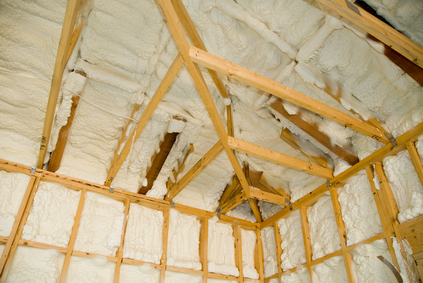 Buildings with spray foam insulation also sell at higher prices, adding value to your property. Gainesville spray foam insulation also discourages pests from burrowing into your home. The insulation is difficult to tear through, and it can be sprayed along cracks and openings to ensure that no uninvited guests attempt to slip inside of your home. You’ll no longer have to fumigate with dangerous pesticides. It can also help keep moisture out, and is excellent for preventing mold and water damage. If you’re looking for a new and exciting form of insulation that boosts your energy efficiency and greatly reduces your carbon footprint, then you should consider installing new cellulose insulation in your home. This form of insulation is made of recycled materials and is completely biodegradable, removing the potentially harmful byproducts often associated with other forms of insulation from the picture. Not only does it provide an exceptional thermal barrier, but it also keeps mold at bay, and is exceptionally resistant to pests and other problems. If you’re looking for a professional Gainesville Spray Foam Contractor, then give us a call today at 678-561-FOAM (678-561-3626) or complete our request estimate form.